Anyone who feels unsteady or needs some support may need a walking aid. There are a wide range of walking aids to consider such as Walking Frames, Walkers (Zimmer Frames), Four Wheeled Rollators, Tri-Walkers, Walking Sticks and Crutches. Also known as walkers or Zimmer frames, the various options available can offer more versatile support than sticks and crutches. A lightweight walking frame can be used inside or out with adjustable legs to suit the user’s height. It should be narrow enough to negotiate doorways etc. easily. There are trays available to clip on walkers in order to carry meals safely and conveniently. Rollators have four wheels and can be height adjustable with a seat to help support a person that may need to take a little break whilst walking. 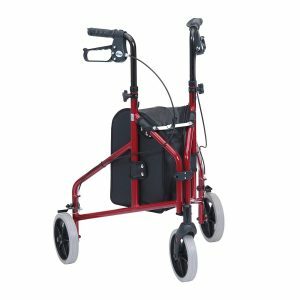 Tri-Walkers can be folded conveniently for transportation and can come with or without a seat and basket or bag for storage. There are a wide variety of Walking Sticks and Crutches available. Stylish and folding walking sticks are available to suit individual requirements. Walking Sticks and Crutches can be height adjustable with various handle styles and grips. H&M have a vast range of Daily Living Aids both instore and available through our selective range of quality suppliers. Our highly trained friendly team are here to help you choose the right product to meet your needs. A small selection of our product range is shown on this website.